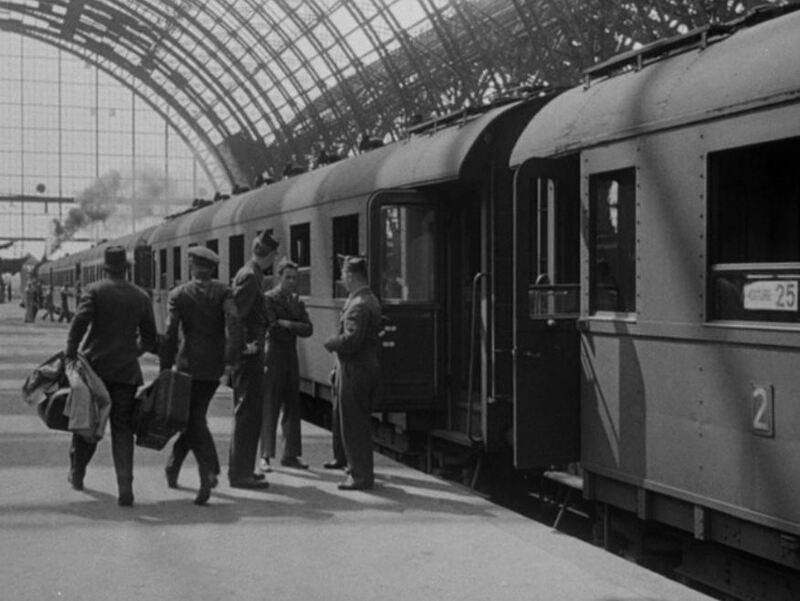 Berlin Express is a very enjoyable bit of film noir that deals with the Allied occupation of Germany immediately after World War 2. 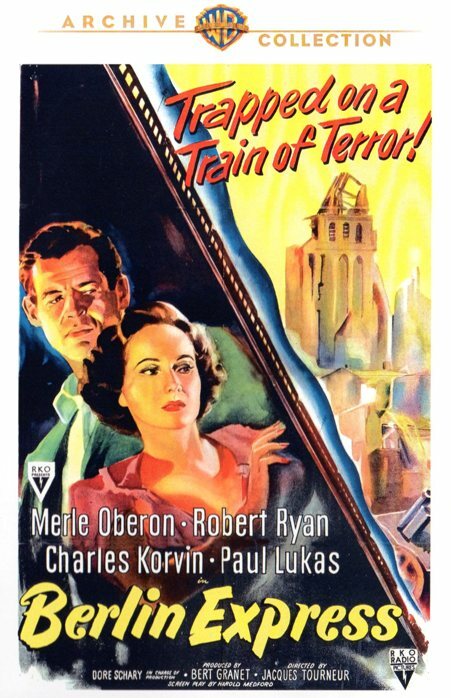 Merle Oberon and Robert Ryan star in this train-encrusted whodunit which accurately depicts that not everyone in Germany was happy with the imposed peace. 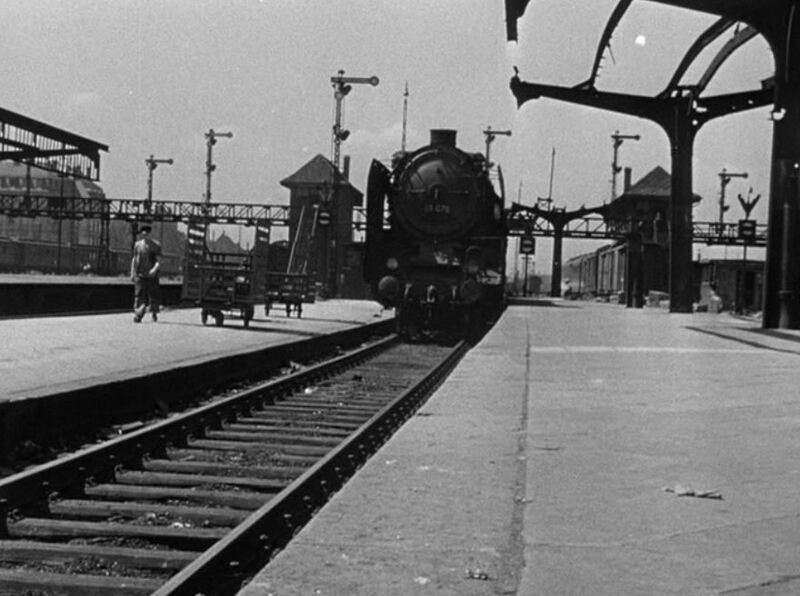 The movie actually depicts TWO train journeys. 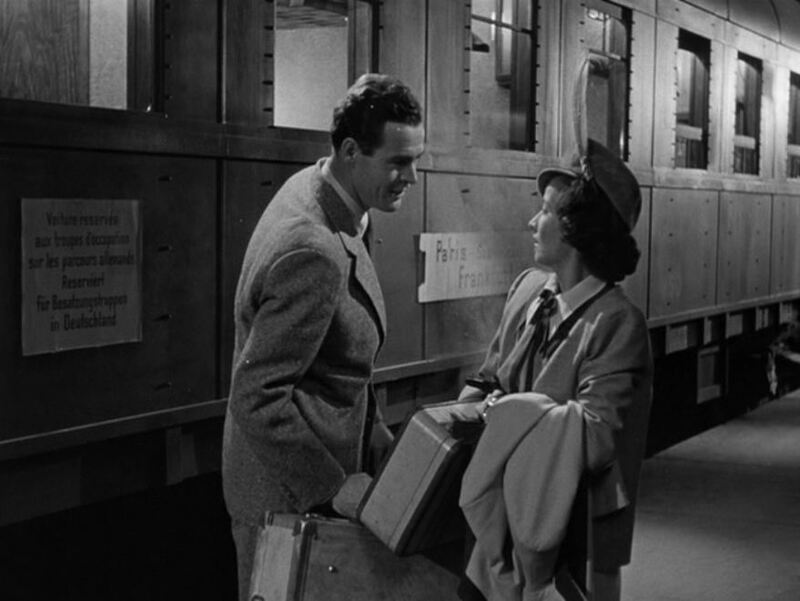 The first is from Paris to Frankfurt (murder!) 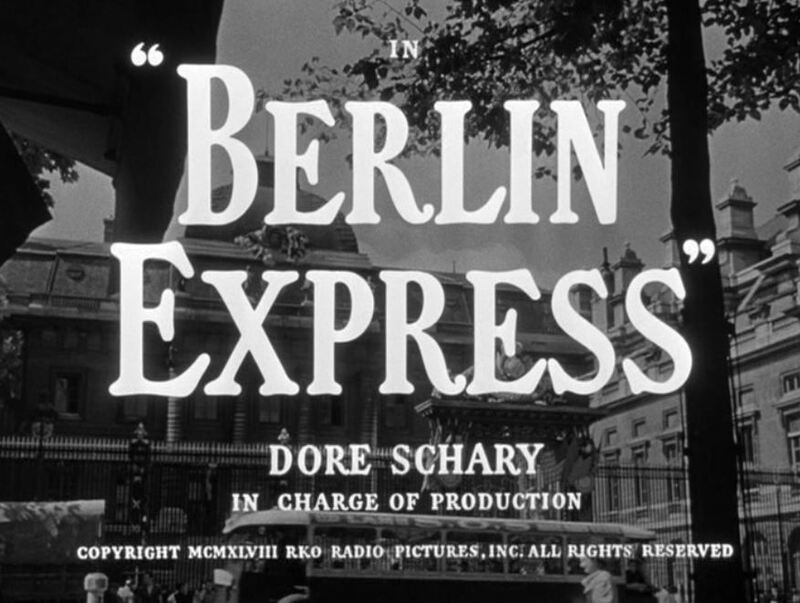 with the second being Frankfurt to Berlin (justice!). 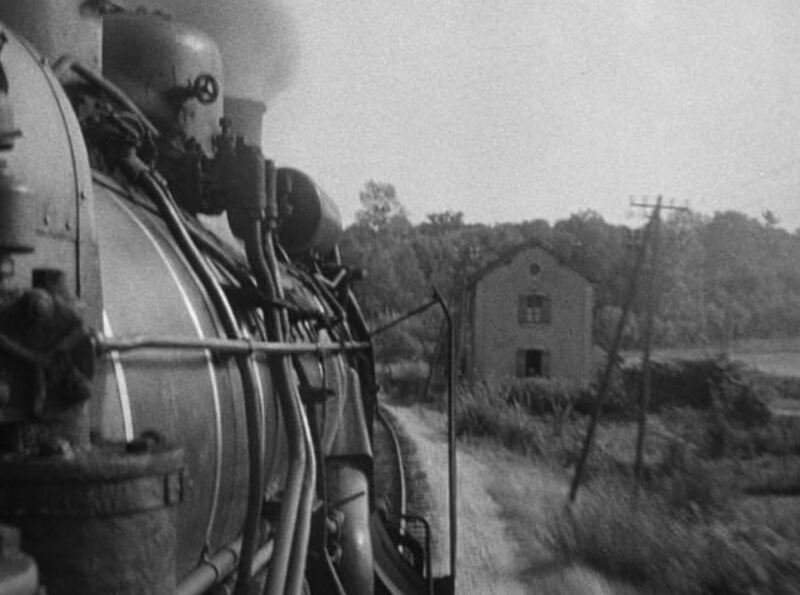 Let’s check out this almost documentary-style excursion featuring steam locomotives galore and war-weary rolling stock. 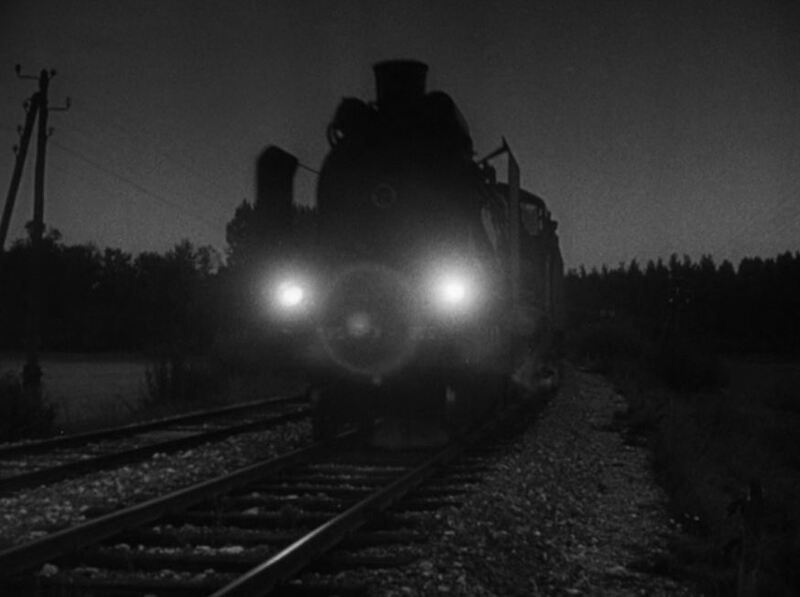 Steaming through the darkness on the way to Frankfurt. Pulling into Frankfurt station with its spectacular arched train shed. 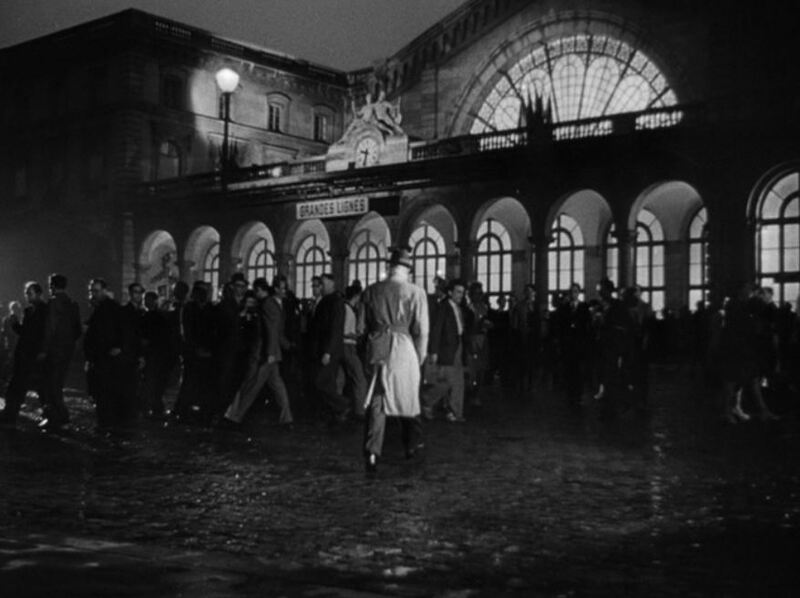 Beautifully-lit “Grandes Lignes” (main lines) entrance to a Paris station; A mysterious stranger (Paul Lukas as Dr. Bernhardt) heads for the Allied RTO (Rail Transportation Office). 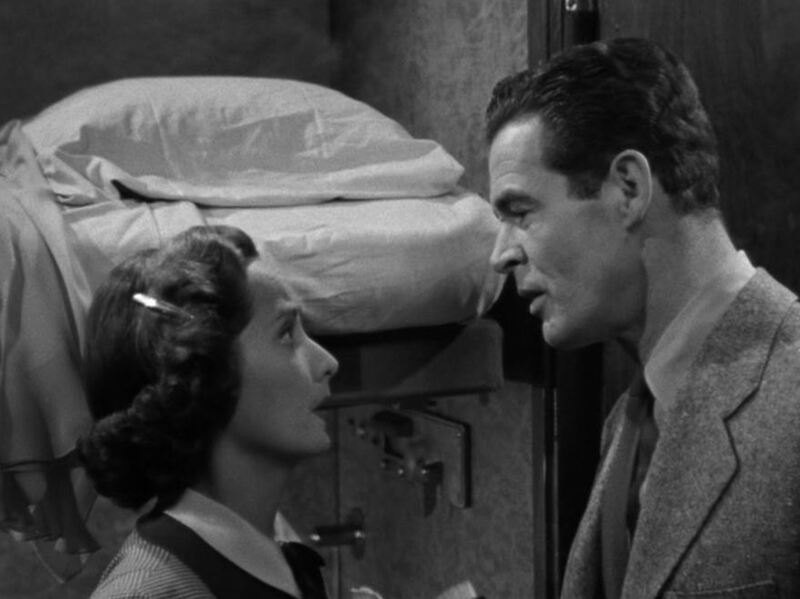 Robert Ryan (as agricultural expert Robert Lindley) chats it up trainside with Merle Oberon (as the enigmatic femme fatale Lucienne). He strikes out. — “Stuck a feather in her cap and called it macaroni!” Merle looks out worriedly from her compartment as the train prepares to leave Paris. 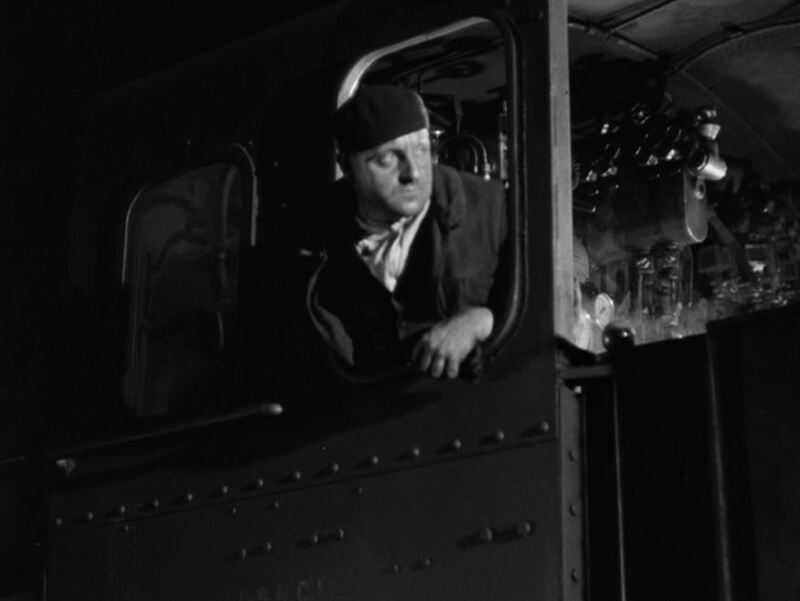 Intrepid engineer looks back for the signal to start; Conductor waves what looks like, to my American eyes, to be a stop signal. 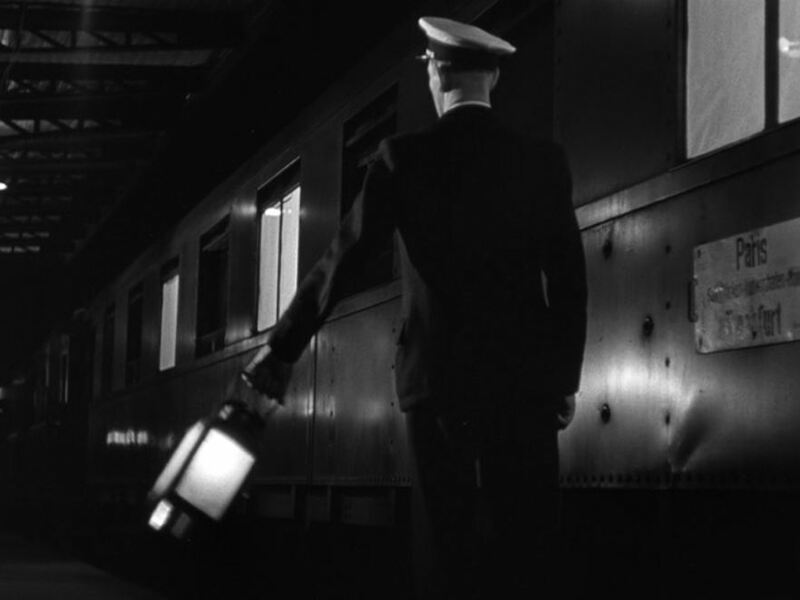 It turns out it means, “Highball – Proceed” in Paris-talk. What the heck does this mean? 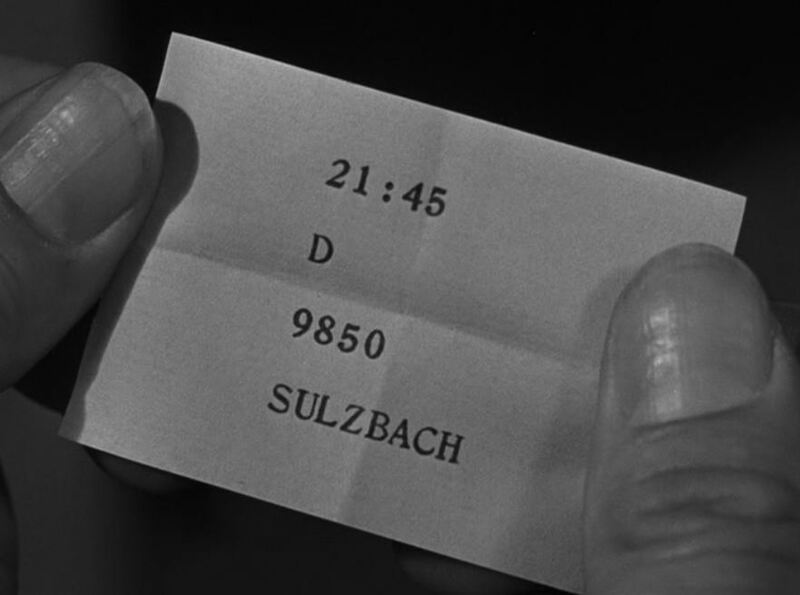 What’s a Sulzbach? 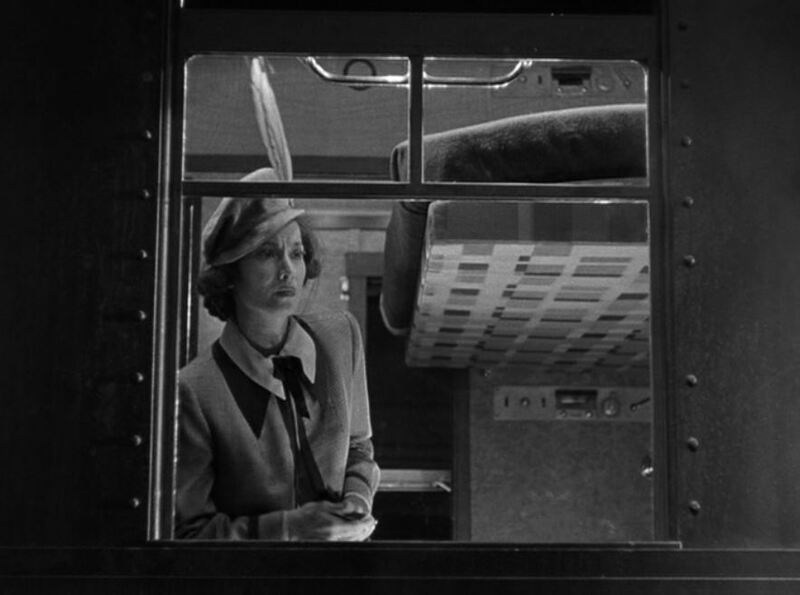 ; “How about we share the compartment, baby?” Strike two. Vait! Schtopp! Achtung! 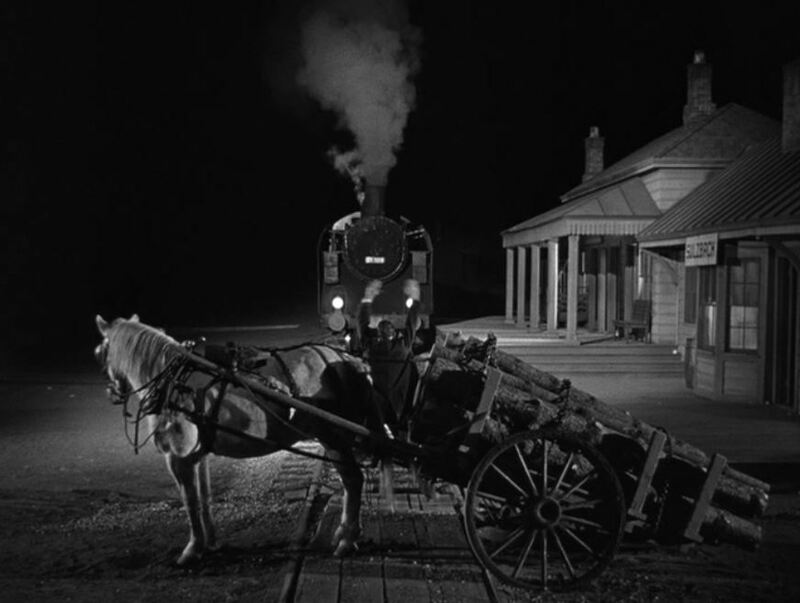 (please don’t run over my horse and cart); Beautiful noirish backlit shot of the train as the guards hustle forward to see about the delay. Which one of these is the villian? 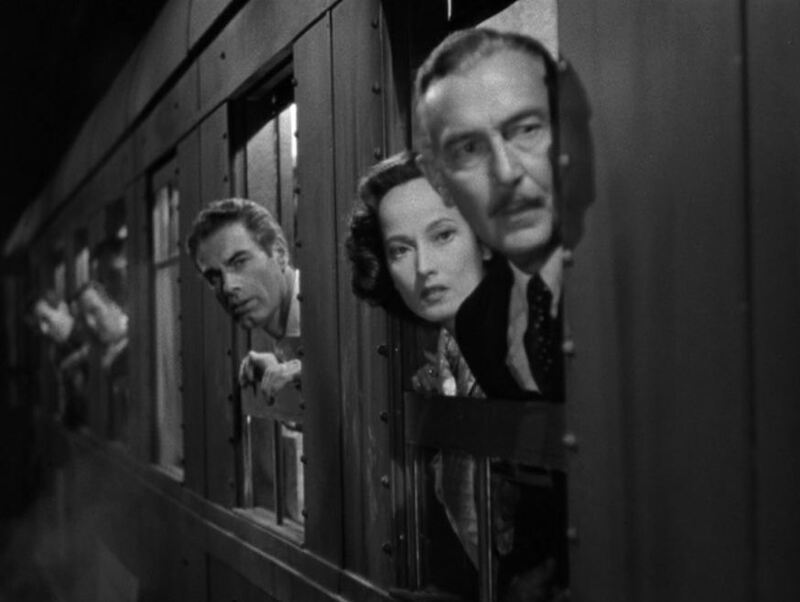 They’ve seem to have made an unscheduled stop; (Gasp!) 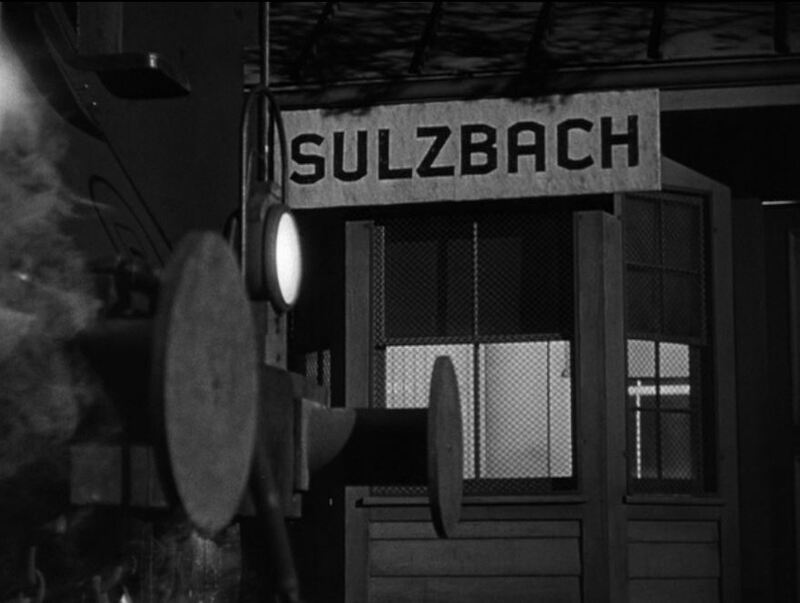 It’s Sulzbach! 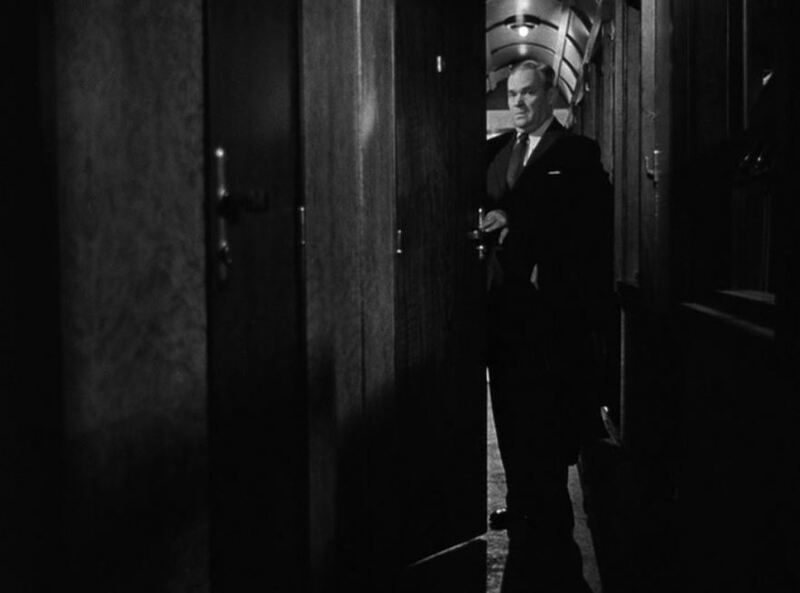 Doctor Bernhardt retires to his compartment; Ka-Boom! Scratch one, peace-loving German. Comes the dawn. 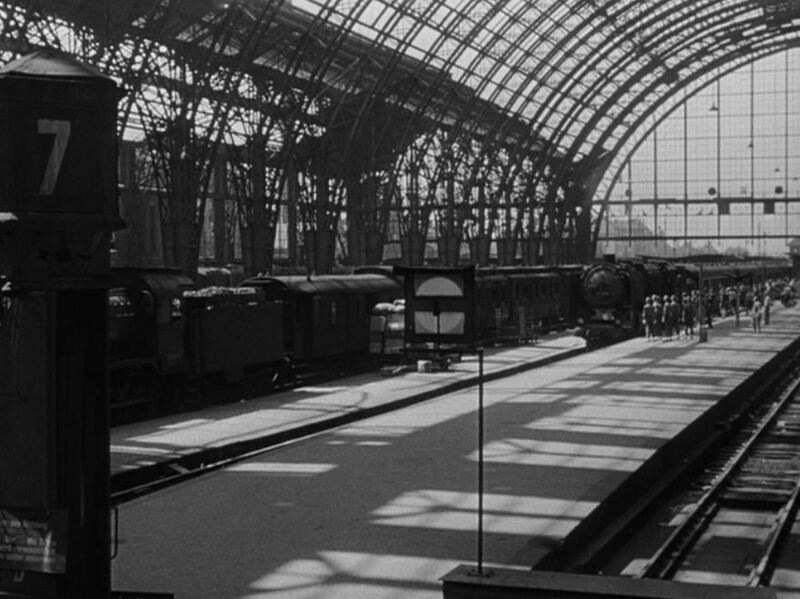 Rolling into Frankfurt station and through the enormous train shed. 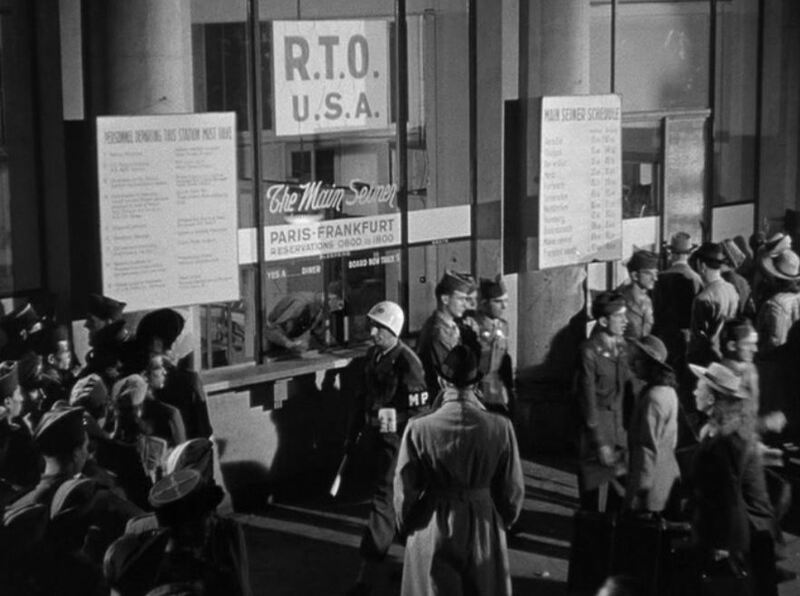 This station was purposely not bombed by the Allies during WW2 as they knew it would be needed during the postwar occupation. 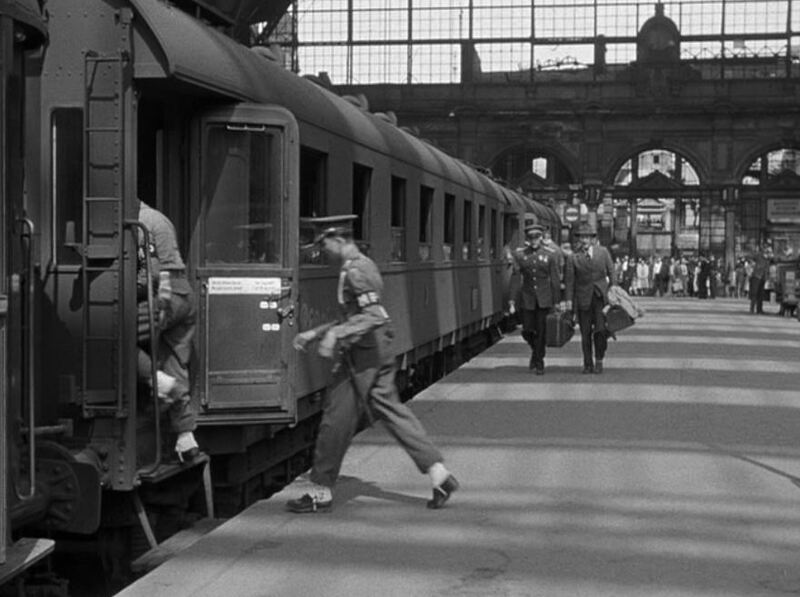 Getting ready to pull out of Frankfurt station on the Berlin Express. 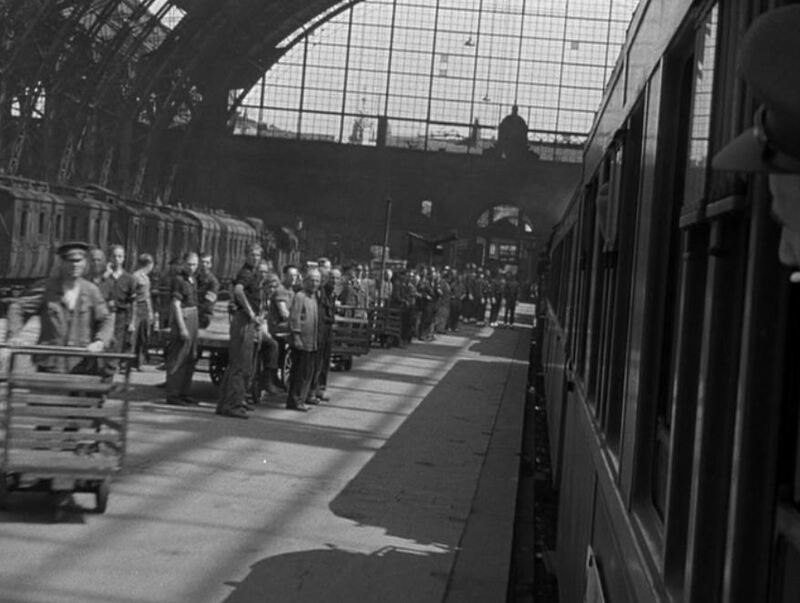 A good view of the typical post-war rolling stock. 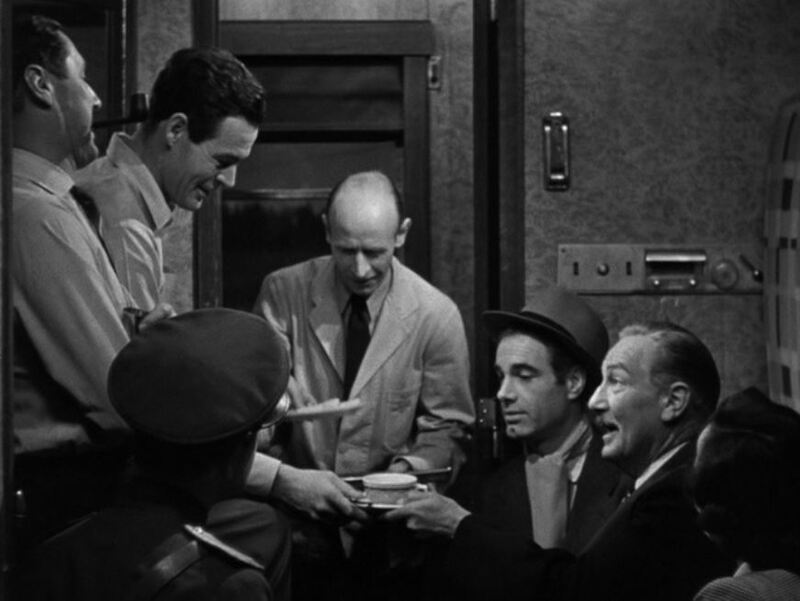 A little kaffeeklatsch as they roll towards Berlin; Ryan once again trying to make time with Merle — but what’s this? Someone’s being strangled in the background! (Yes, strike three to Ryan). 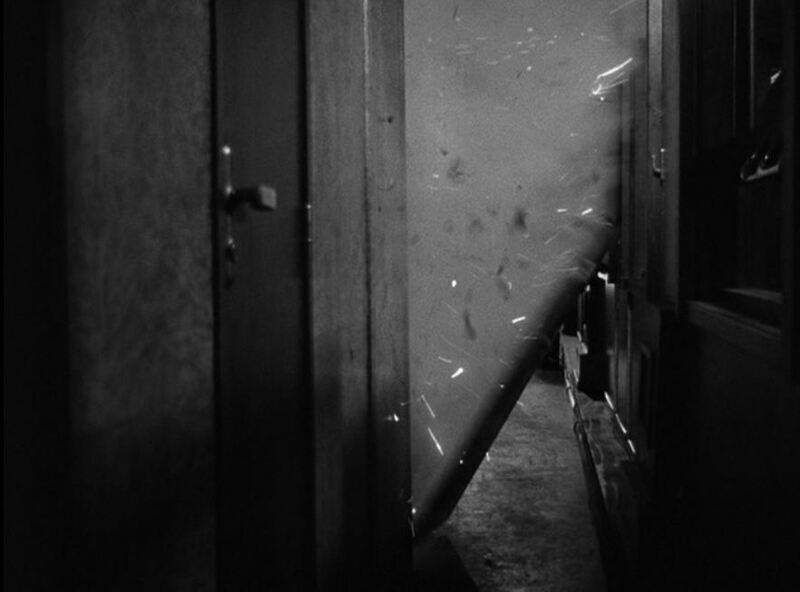 A view down the boiler as the train takes a curve; Finally pulling into “RTO Wannsee Berlin”…but who was the mad killer? Buy, rent or stream this film and find out!! A most entertaining picture from RKO. 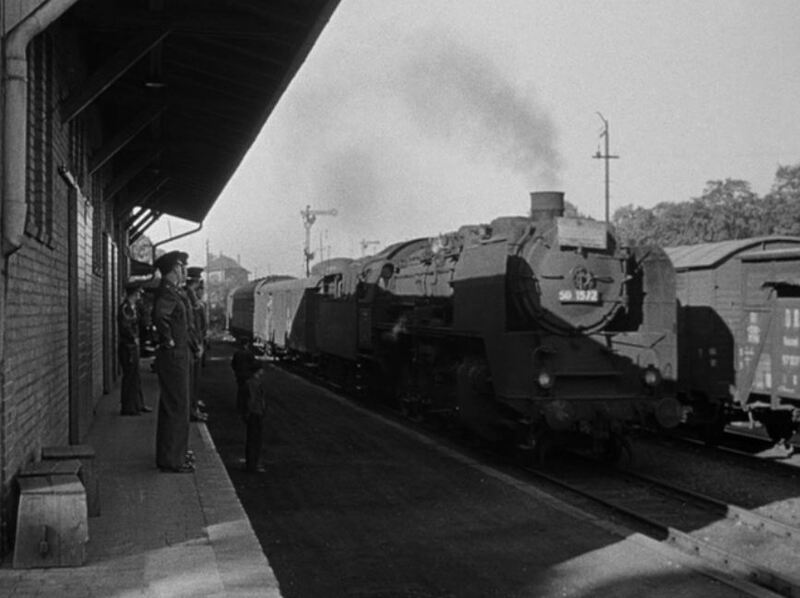 Highly recommended and truly an Unbekannter Zug Film! 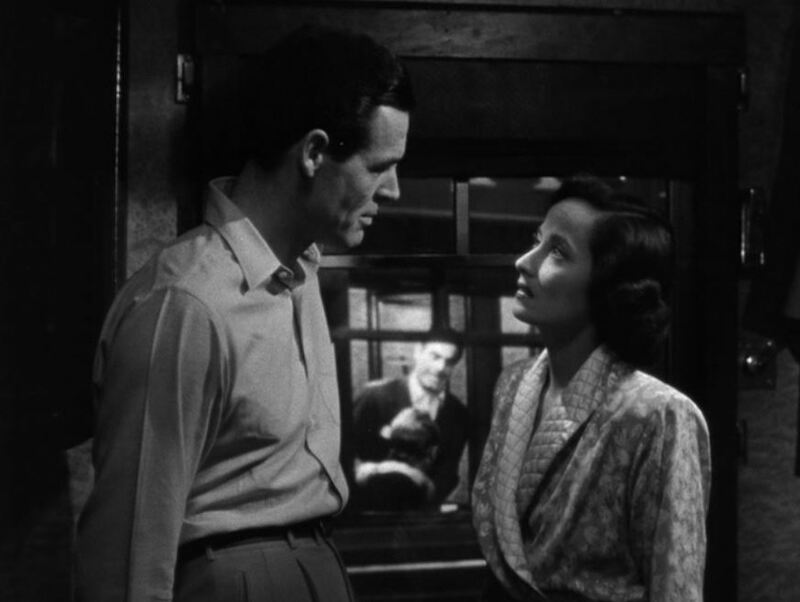 This entry was posted in Uncategorized and tagged Berlin Express, Deutsche Bahn, Film Noir, Frankfurt, Germany, Merle Oberon, RKO Radio Pictures, Robert Ryan, Steam Locomotive, World War 2. Bookmark the permalink. 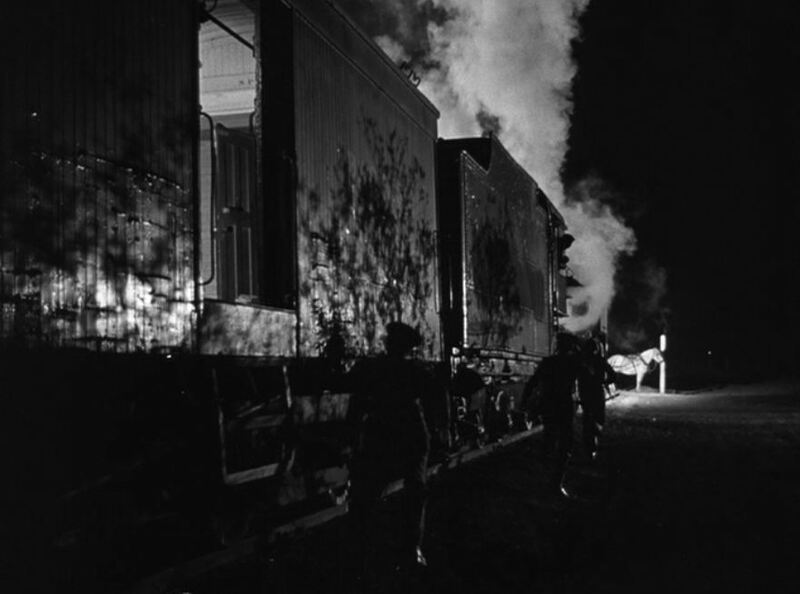 I totally want to see this now — those night shots are beautifully lit. O Winston Link would be proud!